Truth by Kbaig: Dr. Arsalan Iftikhar Chaudhary in The Past? Dr. Arsalan Iftikhar Chaudhary in The Past? 1. 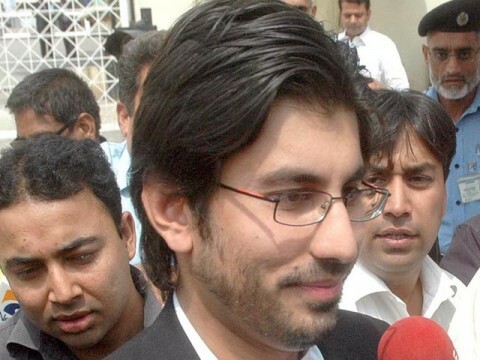 Dr. Arsalan Iftikhar is one of the sons of the Chief Justice Of Pakistan.The learned judge committed misconduct by employing his position to gain undue advantage for Dr. Arsalan Iftikhar. To secure this end he committed and was responsible for the commission of a number of unlawful acts.He unlawfully used his position as a judge and Chief Justice of the Supreme Court of Pakistan influence, harass and intimidate all concerned and compelled them to act in an unlawful manner. Such conduct is unbecoming a judge and is particularly reprehensible in the case of the Chief Justice of Pakistan. 2. Dr. Arsalan Iftikhar sought admission to Bolan Medical College in the year 1996. Having secured 639 marks with an overall "C" grade in his Intermediate Examinations he could not be admitted on merit. The threshold being 750 marks. The Chief Minister of Balochistan was approached who nominated him, "for admission in 1st year MBBS class in Bolan Medical College, Quetta, against leftover foreign vacant seats/special seats". 3. On 22 June 2005 Dr. Arsalan Iftikhar was appointed as Medical Officer/Demonstrator in the Institute of Public Health, Quetta. The Chief Secretary, Balochistan, to whom these orders were addressed, directed these to the Health Department on that very day (18 July 2005). 5. The Health Department on 10 August 2005 referred the case to the Services and General Administration Department ("S&GAD") as the authority "for posting/transfer of Secretariat staff is S&GAD Department. 6. On 11 August 2005, in a Summary for the Chief Minister, the S&GAD pointed out that "no … post in Technical quota is available against which Dr. Arsalan could be considered for posting as Section Officer". It was, however, pointed out that 07 posts of Section Officers against the "quota of initial recruitment are vacant", the case for placing the requisition of these posts with the Balochistan Public Service Commission was being processed separately. It was "proposed that Dr. Arsalan Iftikhar be considered for posting as Section Officer against one of the vacant post as a temporary arrangement". 7. On 15 August 2005 a notification was issued to the effect that Dr Arsalan Iftikhar Demonstrator in Institute of Public Health, Quetta, was "transferred and posted as Section Officer (Dev) in Health Department, against existing vacancy with immediate effect until further orders." [Emphasis supplied]. It may be stated that as was pointed out in the Summary to the Chief Minister, there was no existing vacancy. The 07 vacancies had to be filled by initial recruitment through the Balochistan Public Service Commission. What was proposed was that at best Dr Arsalan Iftikhar be temporarily accommodated against one of these vacancies, till it was filled by a suitable candidate by the Balochistan Public Service Commission. 2. It would be highly appreciated if you could place the service of Dr Arsalan Iftikhar at the disposal of the Ministry of Interior for posting in FIA. On 13 August 2005, two days prior to the notification of 15 August 2005, the S&GAD, Government of Balochistan conveyed to the Ministry of Interior, Government of Pakistan, its "no objection for placing the services of Dr. Arsalan Iftikhar (Health/B-17) at the disposal of Ministry of Interior for posting in FIA. While this letter was either in the mail or had not reached the "right" hands, the Ministry of Interior sent a reminder on 16 August 2005. 9. On 5 September 2005 a notification was issued by the Ministry of Interior, Government of Pakistan. Dr Arsalan Iftikhar was transferred and his services were placed at the disposal of FIA for posting as Assistant Director (BS-17) in the FIA, on deputation for a period of three years, in his own pay and scale, with immediate effect and until further order. 10. On 9 September 2005, the Secretary S&GAD brought the matter to the attention of the Chief Secretary, Balochistan. On 13 September 2005 the Chief Secretary Balochistan on behalf of S&GAD issued a notification pursuant to the notification of the Government of Pakistan. On 30 September 2005 Dr Arsalan Iftikhar received charge of the office of Assistant Director, FIA at Islamabad. This was notified on 24 October 2005. 11. Within four months of his appointment as Medical Officer/Demonstrator in the Institute of Public Health, Quetta, Dr Arsalan a BS-17 officer, who had not even completed the mandatory period of his probation, was transferred and posted first as a Section Officer in the Government of Balochistan against a non-existent vacancy and then sent on deputation as Assistant Director, FIA, to the Ministry of Interior, Government of Pakistan, for a period of three years; all in the public interest. And this for a person who had appeared thrice in the CSS competitive examinations and failed each time. 12. Under Rule 8 of the Health Department, Government of Balochistan, Service Rules 1984, a person appointed to the service against a substantive vacancy remains on probation for a period of two years if appointed by initial recruitment. Dr Arsalan, having been so appointed, on 22 June 2005, his period of probation would have been completed on 21 June 2007. 13. On 22 November 2005 the S&GAD, Government of Balochistan moved a summary to the Chief Minister, Balochistan proposing confirmation in services of Dr Arsalan Iftikhar "with immediate effect against the substantive post of Medical Officer in the Provincial Health Department by relaxing Rule 8 of the Balochistan Health Department (Basic Pay Scale 16 and above) Service Rules 1984 for completion of probation period of 2 years." On 5 December 2005 the S&GAD, Government of Balochistan issued a notification whereby the services of Dr Arsalan Iftikhar were confirmed. Now he has been upgraded as Deputy Director in BPS-18 with retrospective effect, i.e. from the date of initial joining as per notification dated 22-03-2006. Dr Arslan Iftikhar has assumed the charge of the post of Deputy Director /BS-18, FIA on 3rd September 2005 with retrospective effect. 15. This done, a campaign was launched to induct Dr Arsalan Ifitkhar in the Police Service of Pakistan. As BS-17 officer Dr. Arslan Ifitkhar could have joined the Police Service only through the competitive services examination conducted by the Federal Public services commission but being in BS-18 made induction possible and the FPSC route could be avoided. As a first step he was to be sent to the Police Academy for training with PSP officers all of whom had been selected by the Federal Public Services Commission. The training was exclusive to PSP officers. 16. On 19 May 2006, the Ministry of Interior addressed a letter to Commandant, National Police Academy, Islamabad, stating that Dr. Arshaln Iftikhar, Deputy Director, FIA, was attached with the National Police Academy for training with CTP batch. The Commandant was requested to attach the said officer for field training along with under training ASPs to cover catch aspect of the required training. 17. On 24 May 2006, the Ministry of Interior again issued a letter to the Commandant, National Police Academy, Islamabad, stating that after the completion of the specialized training programme at the National Police Academy, the services of Dr Arslan Iftikhar be placed at the disposal of Punjab Police for further posting atLahore for his District Attachment Training. 18. Pursuant to the letter of 24 May 2006, the National Police Academy, Islamabad, on 27 June 2006 relieved Dr Arslan Ifitkhar, "for completion of remaining training programme of 32nd CTP, and directed to report to Elite Police Training School, Bedian Lahore on 02-07-2006 doing six weeks Orientation Course." After completion of the course he was to "report to CPO, Punjab, Lahore for Phase III part of training which is six months Field Attachment". 19. In the meantime, the Prime Minister's Secretariat was approached for the permanent induction of Dr Arsalan Iftikhar in the Police Service of Pakistan in BS-18. On 16 May 2006 the Prime Minister's Secretariat sought the views of the Establishment Division in that regard. 20. The UO Note of the Prime Minister's Secretariat was also circulated to FIA. On 3 June 2006 the Office of the Director General, FIA, stated that, "neither FIA requisitioned his services, nor was involved at any stage for his deputation or district attachment etc." FIA, therefore, expressed its inability to offer any views/recommendations on the UO Note. 21. On 23 May 2006 the Establishment Division noted that as per the PSP (Composition, Cadre and Seniority) Rules, 1985, "the request of the officer for induction in PSP in BS-18 is not feasible." In a separate note the Establishment Division observed that Dr. Arsalan Iftikhar could not be inducted in the Police Service of Pakistan without an amendment in the PSP (Composition, Cadre and Seniority) Rules, 1985. Such an amendment could only be made with the approval of the President. Pakistan, and sought his son's permanent induction in (BS-18) in the Police Service of Pakistan. The Secretary, Establishment, communicated these demands to the Principal Secretary to the prime Minister, around midnight, the same evening. Soon thereafter the Secretary Establishment received a call from the learned judge saying that he had found a number of precedents of induction into various groups. On 1 June 2006 the papers were received from the learned judge. Later, the learned judge called the Secretary Establishment on the Green Line to enquire if the papers sent by him had been examined. The Secretary Establishment stated that it would take some time. The learned judge stated that orders of the Prime Minister be obtained by referring to these precedents. He was told that a written reference would be made to the Prime Minister's Secretariat giving the precedents as well as the legal position. The learned judge responded that a written reference would "jeopardize the case and that this was part of a package and reference to the rules need not be made." 23. The learned judge continued to "insist" that all concerned make the necessary changes and warned of "consequences" if his desires were not met. Due to the relentless pressure and the campaign of intimidation and harassment launched by him, ultimately a summary was prepared and submitted by the Establishment Secretary on 23 June 2006 to the Prime Minister for addition of a new "Rule 7-C" in the Police Service of Pakistan (Composition, Cadre and Seniority) Rules, 1985. The amendment was tailor made for Dr. Arsalan Iftikhar. 24. Since then the learned judge has almost on a daily basis exerted all kinds of pressure on the Prime Minister's Secretariat to secure the approval of the summary aforementioned and for the consequent induction of Dr. Arsalan Iftikhar as an officer in the Police Service of Pakistan as a BS-18 officer. 25. He also used his influence and authority to have Dr. Arsalan Iftikhar nominated to attend the 2nd Training Course in Combating International Terrorism and Organized Crime from 30 October 2006 to 3 November 2006 in Istanbul. He was the only non-PSP officer and the only under training person to attend this course.